Newport students win contest to find the state's dumbest law - it's illegal to collect seaweed from beaches after sunset. 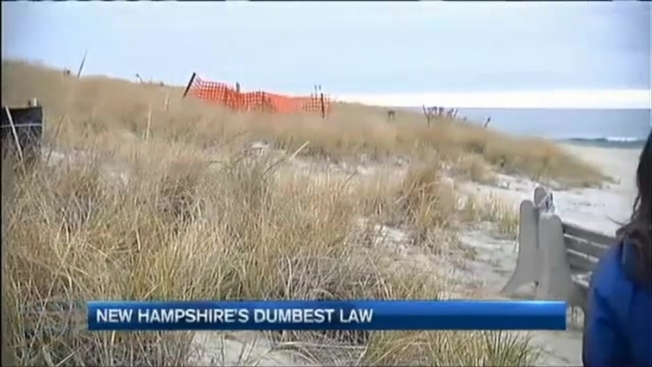 A group of students from a small town in New Hampshire have found the state's dumbest law. Monday, Newport High School sophomore Timothy Poitras read necn the letter from state lawmakers informing him that his class won the New Hampshire's Dumbest Law contest. "I was shocked," Poitras said. Rollie Stapleton's sophomore advisory class chose RSA 207:48 the law that makes it illegal to collect seaweed off the beach after sunset. If you're caught, the violation could carry upwards of a thousand dollars. "When I first read this, I was like you're saying I can't pick it up and plop it down on the beach," Poitras said. "I was like that's bogus!" His classmate Kristopher Mampe shared Poitras' shock, saying, "Newport isn't really heard of, everyone thinks Manchester, Concord, all the bigger ones, but Newport being a bit smaller, won." State Representative Max Abramson of Seabrook started the contest for students across the state last spring. He said there were more than 30 laws submitted. Some of the craziest ones had already been repealed. "You can't tap your foot to music in a bar, that one was repealed a few years ago," Abramson said. "But the most ridiculous one and the one I wish someone had entered was you can't recycle milk jugs. You can go to jail for up to a year in New Hampshire for reusing a dairy container for water or anything other than dairy." Abramson has already submitted a bill that would repeal the seaweed gathering law. Stapleton said her students dedicated time and energy, and researched for weeks — proving that a contest to find the state's dumbest law was a really smart idea. "Following through really is something all students in the U.S. and all over the world need to know how to do," Stapleton said. "It's a tough act to be able to do but Tim's demonstration might show our student that there are results when you follow through. The Newport class is going to the statehouse at the beginning of next year to support the bill that would repeal New Hampshire's dumbest law.